Viking presents their flag ship monocular model the 10x42 ED-M. This premium monocular delivers one of the brightest, sharpest images on the market today. It features extra low dispersion glass (ED) to ensure maximum light transmission when viewing in varying light conditions. The monocular manages to encompass the finest balance between innovation, functionality and design, creating a truly fantastic optical experience. Design was a key area of focus for Viking during the development and testing of this monocular. It incorporates a robust but at the same time compact design (13cm x 4.7cm), meaning the monocular is easy to carry in your pocket but at the same time rigid and strong in use. It is also specially shaped to be as ergonomic and streamlined as possible in order to make long term handling both natural and comfortable. A large and grooved rubber focus wheel, encircles the entire monocular for easy and accurate focusing, even when wearing gloves. The monocular is constructed from an ultra light weight magnesium alloy, making it 30% lighter compared with using other monoculars made from traditional alloys. This was a key design choice in order to make the monocular as light and portable as possible. The body is fully rubber armoured to help protect the internal optical configuration, even when using the monocular in demanding conditions. The rubber armouring also provides a non slip grip which greatly increases the ease of handling such a small device especially when wet. There is a single twist eye cup which can be adjusted to varying levels of height, allowing uncompromised use of the monocular even when wearing spectacles. A single purpose built external lug allows for the attachment of a wrist strap (included) making the monocular even more portable. 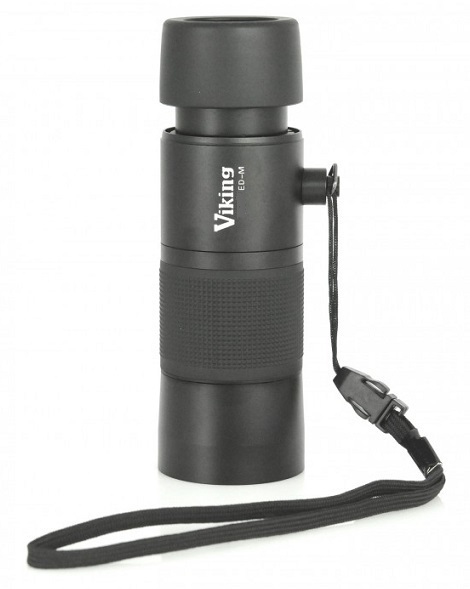 One of the main functional features of the monocular is its Viking Oilphobic lens coating. This type of coating helps the lens to counter water, dirt and general grease build up. Due to the nature of the Oilphobic protective coating, cleaning and care of the lenses is especially easy as dirt and water find it difficult to settle and solidify on the lens surface and can therefore be easily wiped away. The other key functional feature of the monocular is its extra low dispersion ED glass. As a result of this specialist type of glass, light transmission has been proven to be significantly greater over more traditional types of lens glass. The ED glass gives a brighter and crisper image, especially when using the monocular in poorly lit conditions. Furthermore, colour rendition and contrast is also greatly improved, giving the viewer a natural and lifelike image of their chosen subject. Finally, the monocular is 100% waterproof (field tested) and nitrogen gas purged which prevents any level of internal fogging, making it a top performer in damp or wet conditions. The Viking 10x42 ED monocular has a large variety of different applications and uses. For example, it is widely used by bird watchers and conservationists throughout the world, because of its optical quality and proven reliability. At the same time due to its compact and light weight size, it would also make a perfect addition to any safari or adventure holiday, where portability and performance are required. Thanks to its waterproof construction, the monocular would also be particularly suited for use in extremely wet or damp conditions such as onboard boats as well as in the rainforest.